Tides themselves don’t induce (a lot of) mixing, only tides hitting topography do. An experiment. As you might have noticed, the last couple of days I have been super excited to play with the large tanks at GFI in Bergen. But then there are also simple kitchen oceanography experiments that need doing that you can bring into your class with you, like for example one showing that tides and internal waves by themselves don’t do a lot of mixing, and that only when they hit topography the interesting stuff starts happening. So what we need is a simple 2-layer system and two different cases: One with topography, one without. And because we want to use it to hand around in class, the stratification should be indestructible (-> oil and water) and the container should be fairly tightly sealed to prevent a mess. There definitely is a lot to be said for kitchen oceanography, too! Would you have thought that using just two plastic bottles and some oil and water could give such a nice demonstration? This entry was posted in demonstration (easy), hands-on activity (easy), kitchen oceanography and tagged EDarelius&team, GEOF213, internal tides, internal waves, kitchen oceanography, mixing, tides, topography on August 17, 2018 by mglessmer. Would be interesting to see if you can see fronts when the tide is coming in, too, when the muddy river water is pushed into the more stagnant side arms and bays. I expect so but don’t actually know. Maybe I will be able to observe it on some future flight? 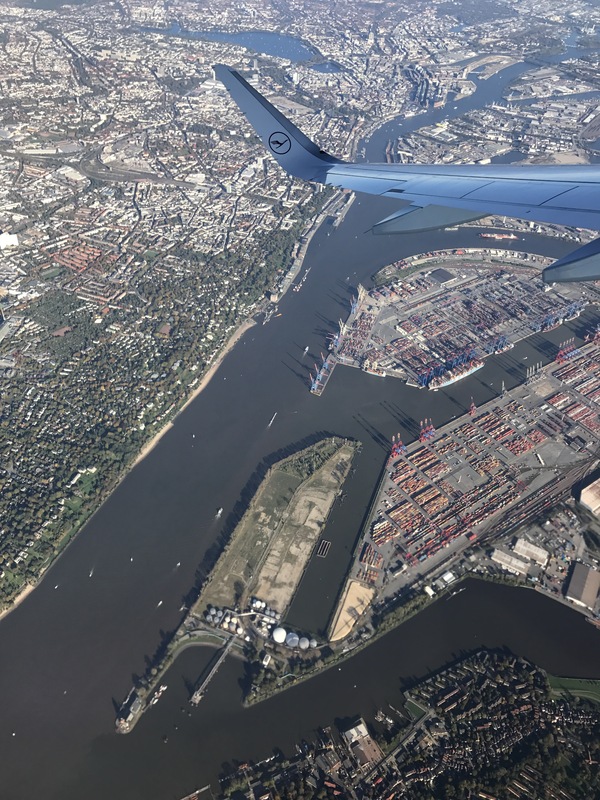 This entry was posted in observation and tagged Elbe, Hamburg, tides on October 15, 2017 by mglessmer. Another thing I can’t stop being fascinated by: Tides. 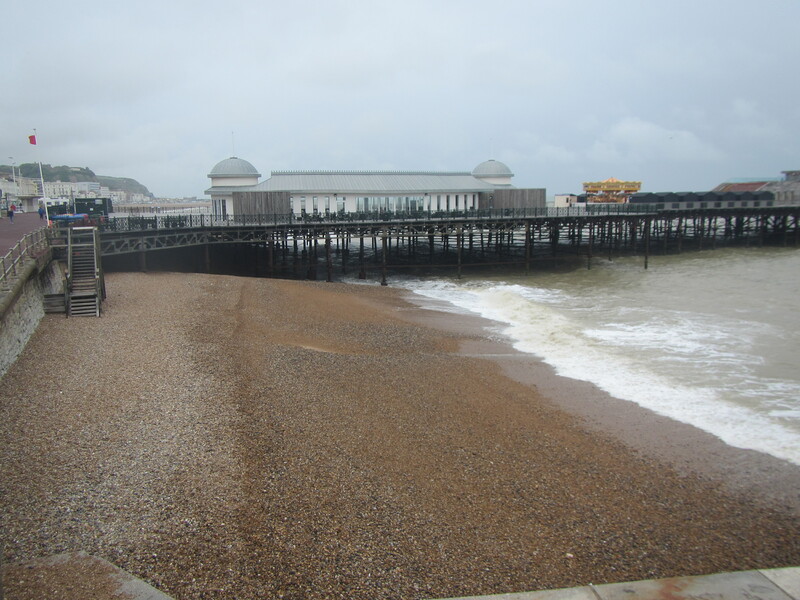 Sometimes you look towards Hastings Pier, and there is water all the way up to the sea wall. Those are the times I am too stunned to take pictures, unfortunately. 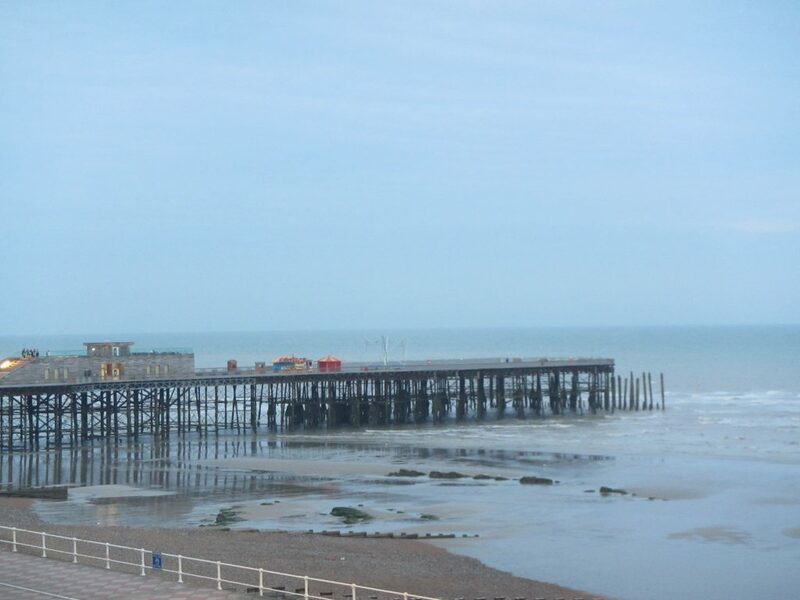 This entry was posted in observation and tagged Hastings, tides on September 8, 2016 by mglessmer. Disclaimer: This post might well be called “fun with tides” similar to Sheldon Cooper’s “fun with flags” — it is super nerdy, but at least I am having fun! 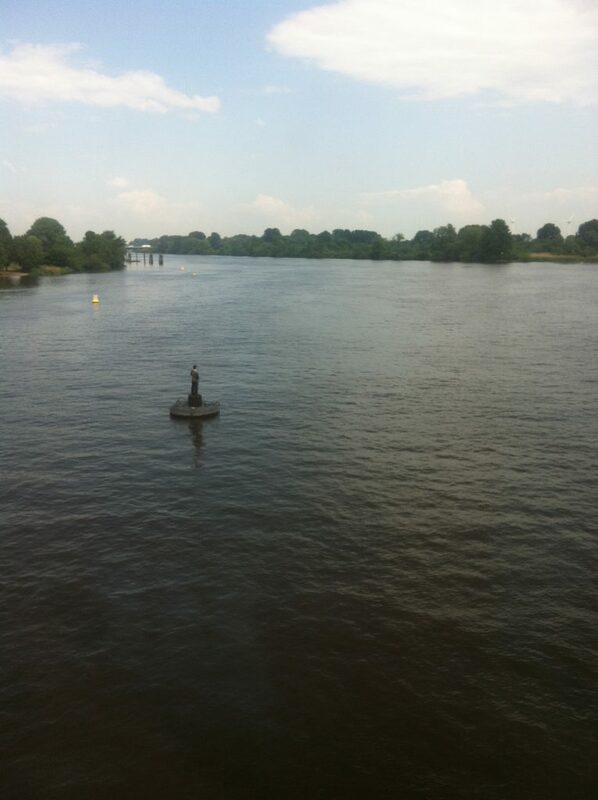 There is some really cool art around Hamburg, and the one I want to talk about today is called “four men on buoys” by Stephan Balkenhol: Four wooden statues of approximately live-sized men, standing on little floats, moored in four different spots all over Hamburg. 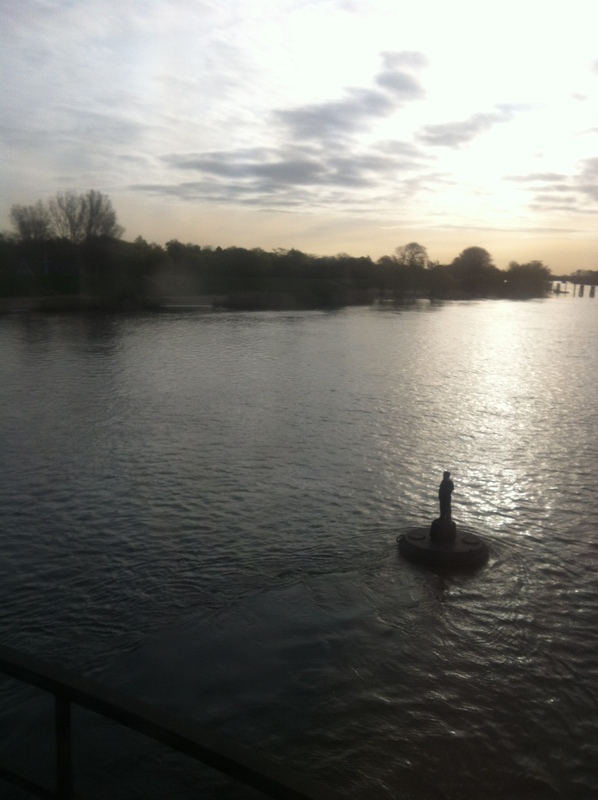 One of them happens to be on the Elbe river, visible when you cross the bridge from where I work over to the city center. 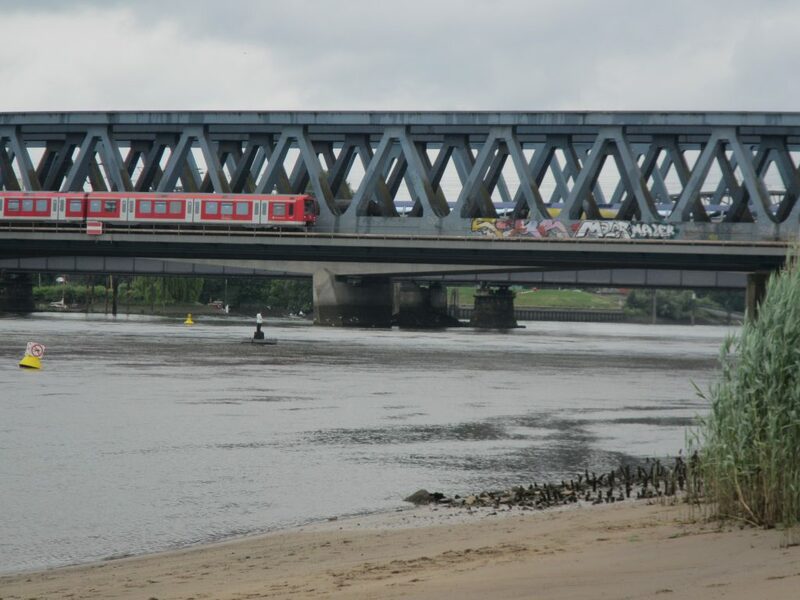 You ca see the scene below: The train going across the bridge, and the guy (in the white shirt) standing on the river. What you can sort of see in the picture above from the yellow buoy being tilted to the right: There is quite a strong current in that river. And what you can’t see in the picture, but will find out below: It’s a tidal current, hence its direction reverses regularly. 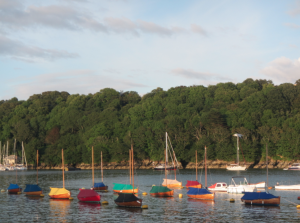 You can guess what that means for anything moored in the river: Yes, it will change its position following the tides! 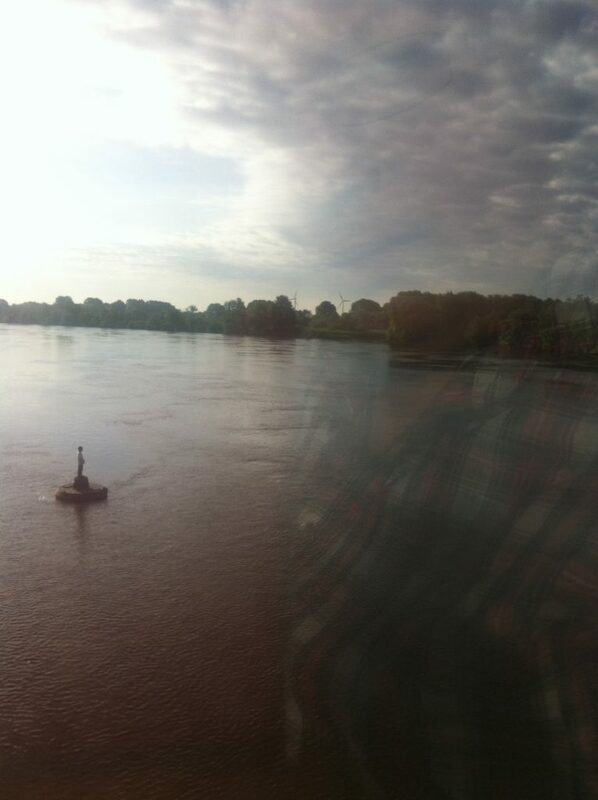 As you see in the image below, the wake is in the direction towards the viewer. This means that the water is flowing towards the viewer, i.e. downstream. You can see that the current is fairly strong because the wake is very pronounced (“very” at least relative to some other pictures you’ll see later). For this post, I checked my phone and found a collection of 16 pictures of that guy. So clearly I had to see when they were taken relative to the time of high water that day. In the image below, each tick marks the time of one of my pictures relative to zero, the time of the nearest high water. 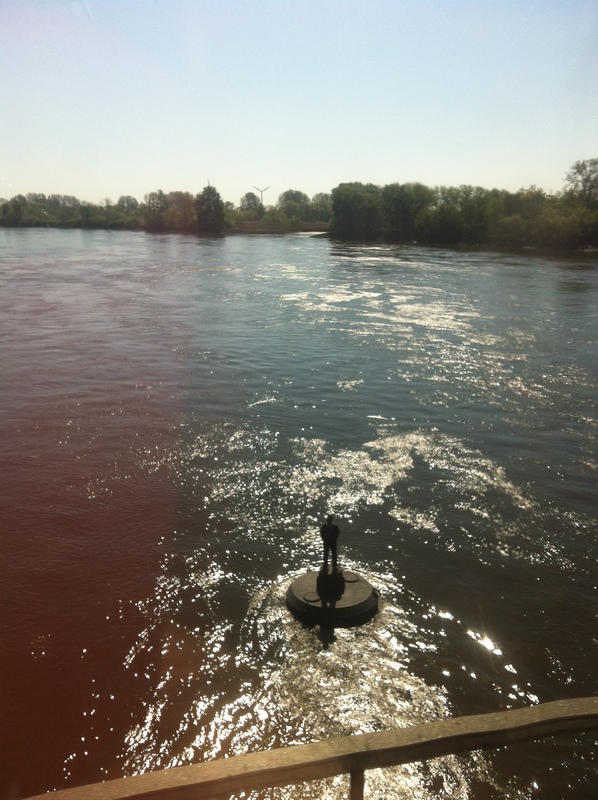 The guy on the buoy, plus an eye-balled plot of my data points. 0==high water. This picture was taken 1 1/2 hours after high water that day. As you can see, I seem to be on the train more when it’s close to high water than close to low water. Funny! And here are all 16 pictures, in the order going from low water to high water to low water. The caption includes the time before/after high water. Enjoy! 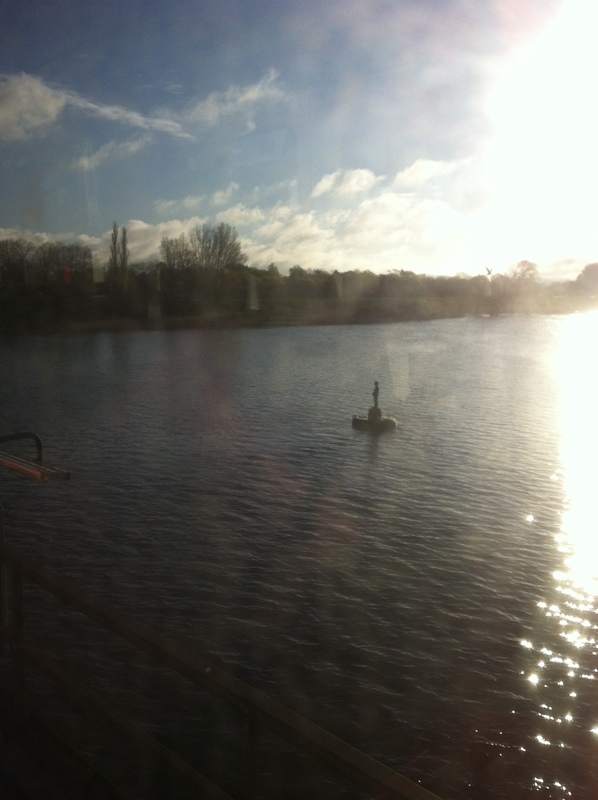 Guy on buoy. Picture taken 4h 50min before high water. 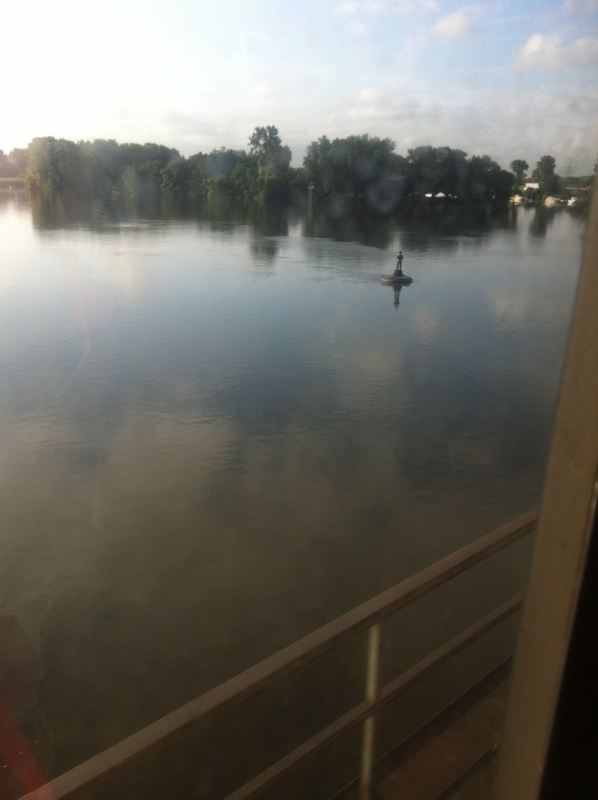 Guy on buoy. Picture taken 4h 02min before high water. Guy on buoy. Picture taken 2h 34min before high water. Guy on buoy. Picture taken 1h 14min before high water. 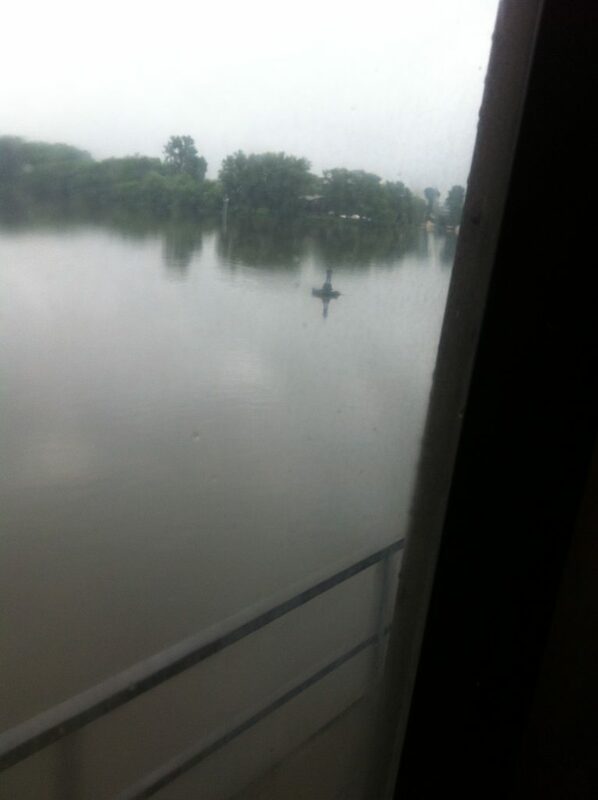 Guy on buoy. Picture taken 1h 06min before high water. Guy on buoy. Picture taken 1h 02min before high water. 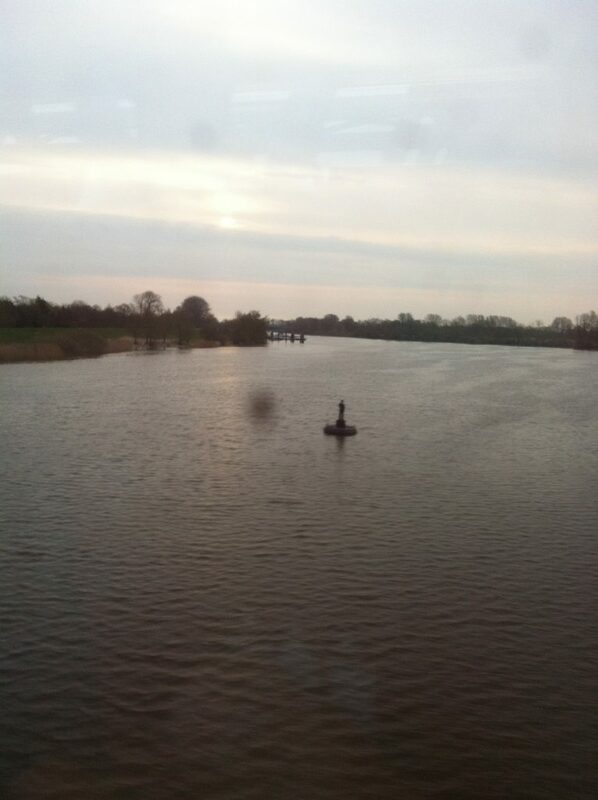 Guy on buoy. Picture taken 0h 27min before high water. 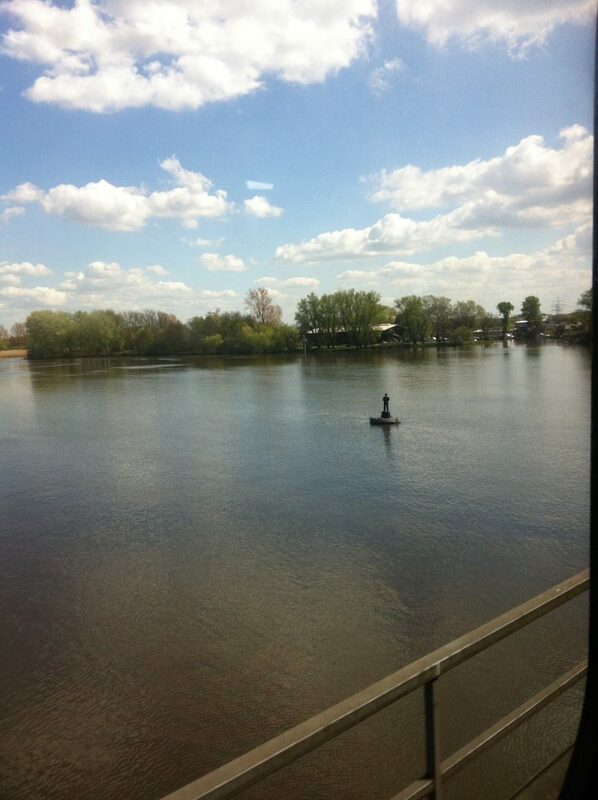 Guy on buoy. Picture taken 0h 26min before high water. 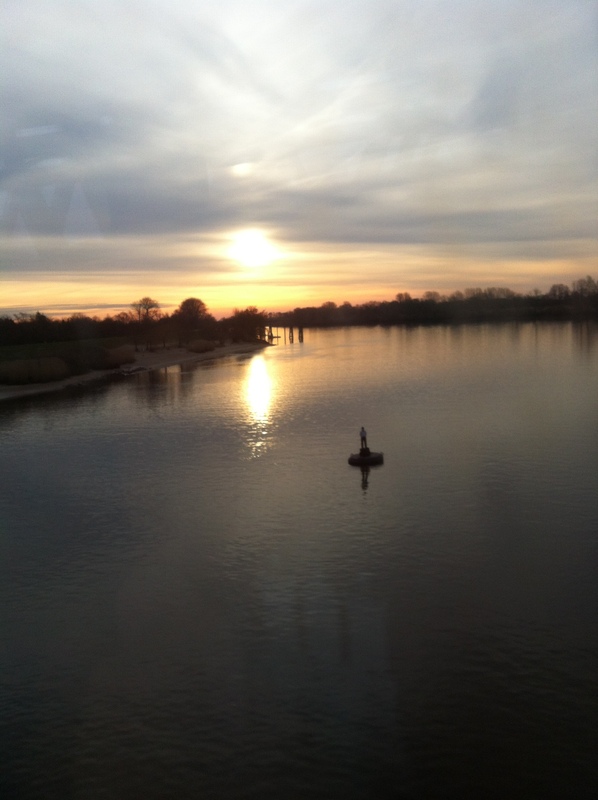 Guy on buoy. Picture taken 0h 25min before high water. Guy on buoy. Picture taken 0h 12 min past high water. 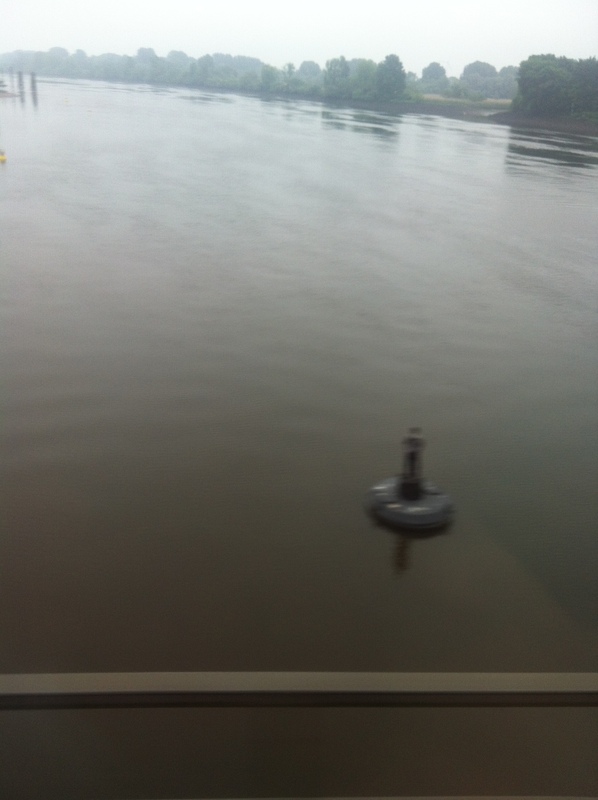 Guy on buoy. 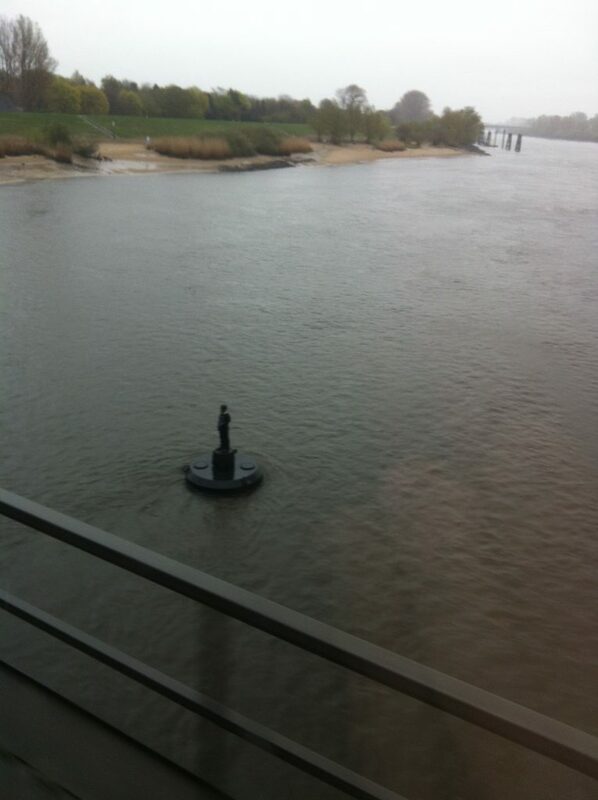 Picture taken 1h 17min past high water. Guy on buoy. Picture taken 1h 38min past high water. 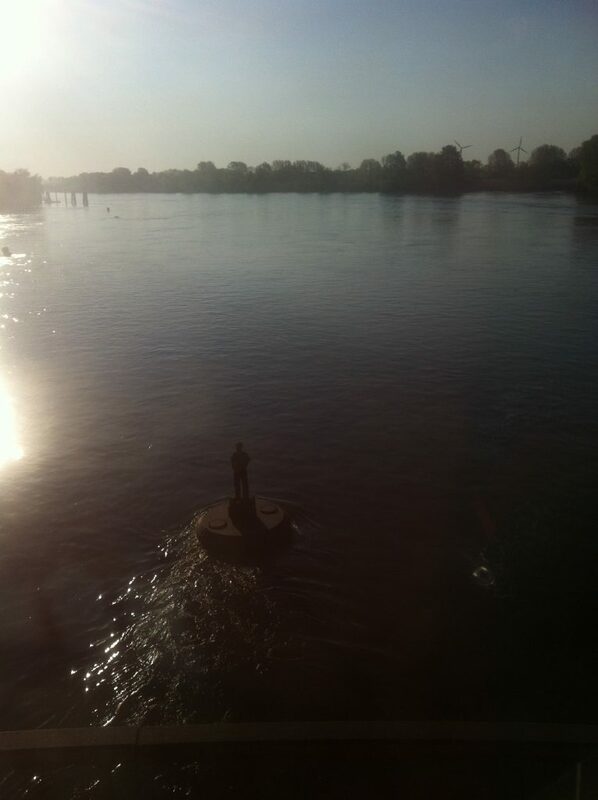 Guy on buoy. Picture taken 1h 48min past high water. 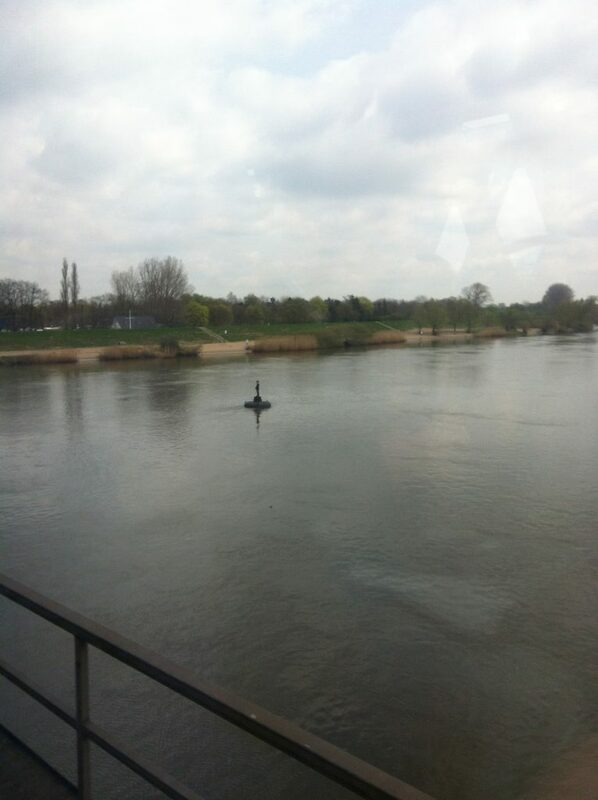 Guy on buoy. Picture taken 3h 32min past high water. 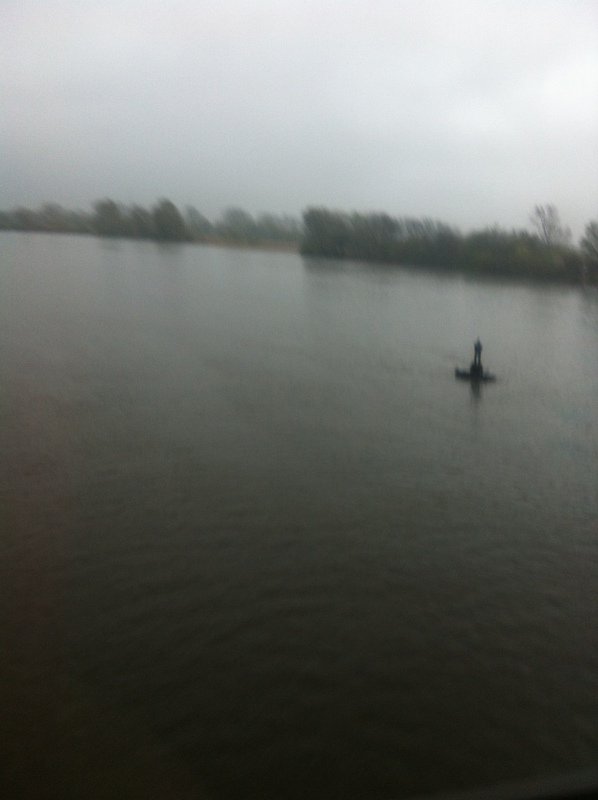 Guy on buoy. 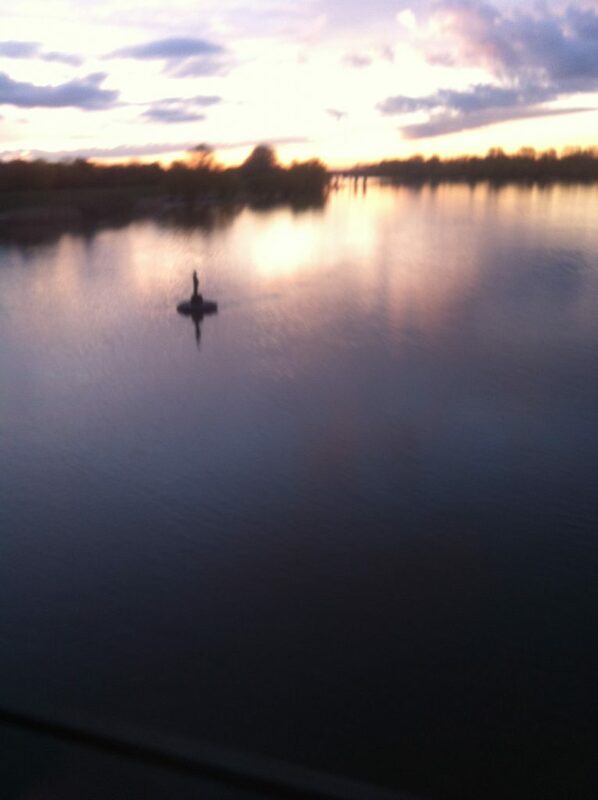 Picture taken 6h 05min past high water. This entry was posted in observation and tagged art, Elbe, tides on June 14, 2016 by mglessmer. For most of my readers it might be pretty obvious what the movement of floating ice says about the flow field “below”, but most “normal” people would probably not even notice that there is something to see. So I want to present a couple of pictures and observations today to help you talk to the people around you and maybe get them interested in observing the world around them more closely (or at least the water-covered parts of the world around them ;-)). What exactly is happening at those pillars can be seen even more clearly when looking at a different one below. You see the ice piling up on the upstream side of the pillar, and the wake in the lee. 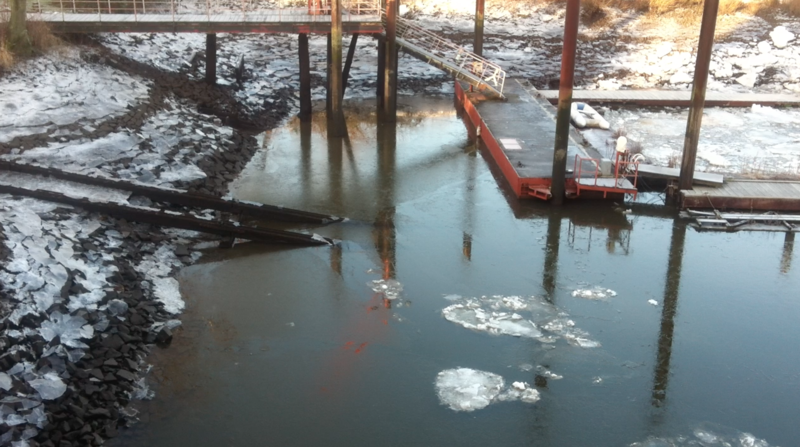 Some smaller ice floes get caught in the return flow just behind the pillar. Now imagine the same thing for a larger pillar – that’s exactly what we saw above! And then we can also see that we are dealing with a tidal river. Looking at the direction of the current only helps half of the time only, and only if we know something about the geography to know which way the river is supposed to be going. But look at the picture below: There we see sheets of ice propped up the rails where the rails meet the ice, and more sheets of ice all over the shore line. As the water level drops due to tides, newly formed ice falls dry and that’s all the sheets of ice you see on land. 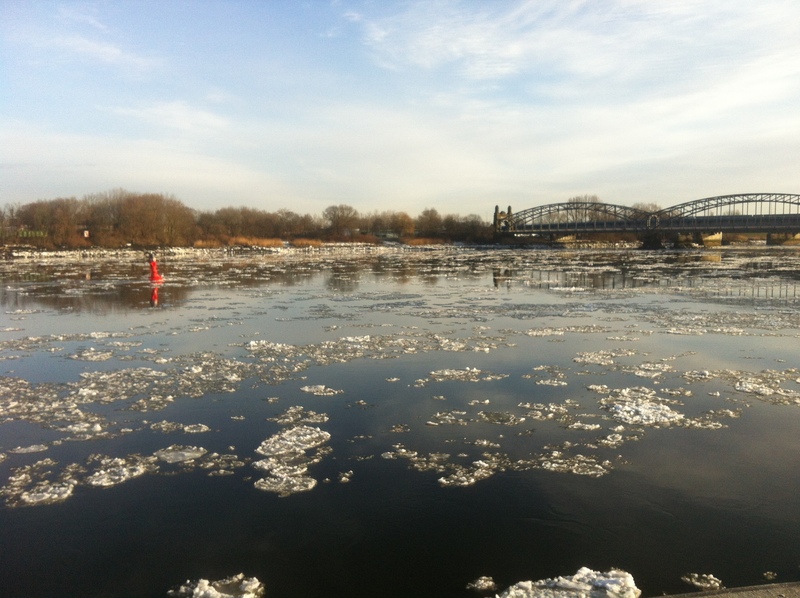 The bigger ice floes in the picture have likely come in from the main arm of the Elbe river. Small port on a tiny bay on the Elbe river in Hamburg. Look at the sheets of ice on shore! It is actually pretty cool to watch the recirculation that goes on in all those small bays (movie below picture). Wouldn’t you assume that they are pretty sheltered from the general flow? 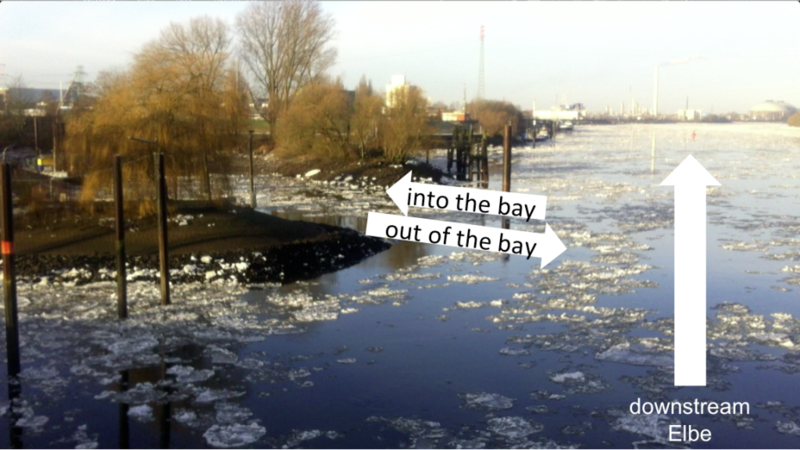 This entry was posted in observation and tagged current, Elbe, flow field, ice, return flow, tidal current, tides on January 21, 2016 by mglessmer. The other day we talked about a very simplistic models of tides in a glass, and how the high tide and low tide travel as a wave around an ocean basin. This isn’t really a news flash for people reading this blog, I know. 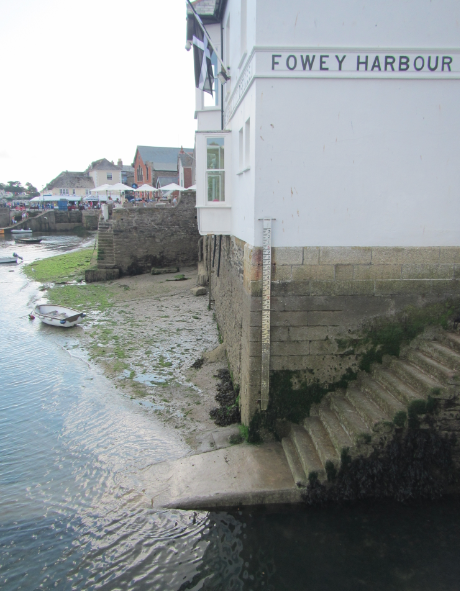 But it is sometimes hard to imagine how big the differences between high tide and low tide actually are, since the water rises and falls so slowly it is hardly noticeable. 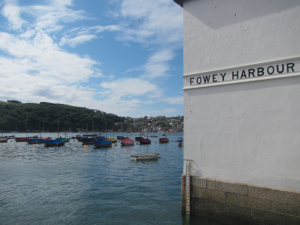 On my most recent holiday (even though “most recent” means “some time during summer”, which is actually quite a while ago), A and I stayed in Fowey and had the best time. Anyway, we happened to stroll along the pier, and I happened to snap this picture. The water was gone! And I still find it absolutely fascinating. Especially since at first glance the tides don’t seem to result in alternating currents. Which is really not possible. 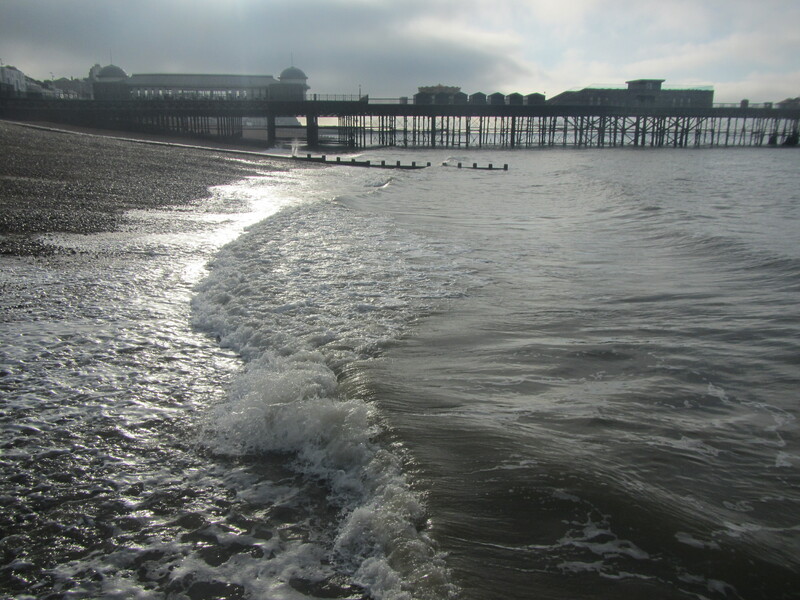 But it took more than just a second look to realize that the tide in the picture above is coming in, whereas the one below is going out (Pictures taken from pretty much the same spot). This entry was posted in observation and tagged Cornwall, tidal current, tides on November 5, 2014 by mglessmer. A very simple experiment to show how waves can travel around an ocean basin. 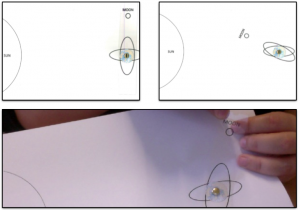 [In a previous experiment] we have learned how tides are caused by the sun and the moon. In the picture there, we see the two “mountains” of water that form on either sided of the earth. The earth rotates underneath those two “mountains” of water, which is what causes high tides twice a day. But what happens when those “mountains” of water reach a coast? Clearly the continents are not flooded twice a day every day, so the “mountains” of water cannot travel all the way around the globe undisturbed. What does happen instead is that the tidal wave will propagate around the rim of an ocean basin, even in semi-enclosed basins like the North Sea, which we will show in the experiment below. Fill the plastic cup approximately half full with water. Mark the still water level with a permanent marker. 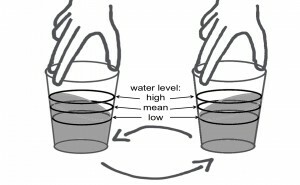 Gently start twirling the cup and observe how the water level starts changing: On one side of the cup it rises, on the other side it falls. 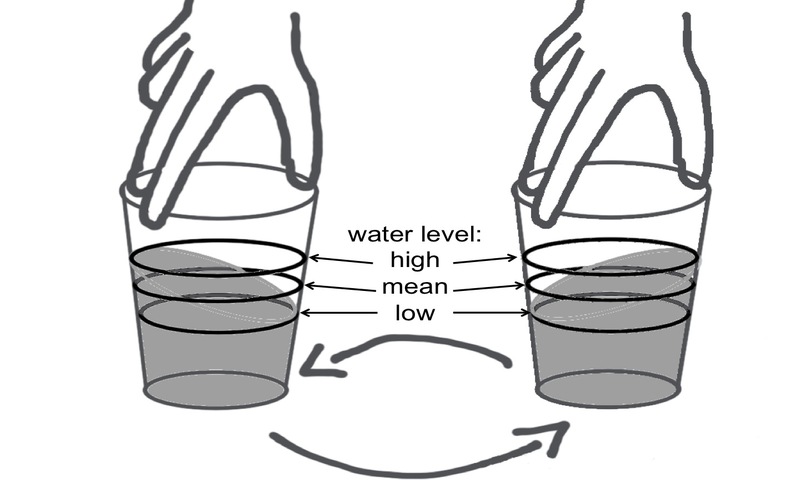 Continue twirling the cup and observe how the “mountain” of water moves all the way round the cup, leaning against the side of the cup, and how opposite of the “mountain” a “valley” forms that also travels around the cup. Mark those two new water levels: The higher one is the high tide line of your ocean in a cup, the lower one the low tide line. This is how high tide and low tide travel around an ocean basin. In the real world, though, coastlines are not as smooth as the walls of a cup, and also ocean basins are connected to each other, so tides in different basins interact. For a real world example, look at the tides in the North Sea, shown in Figure 2. 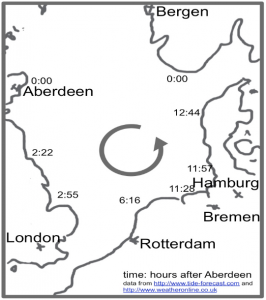 Figure 2: Simplified timing of tides in the North Sea. 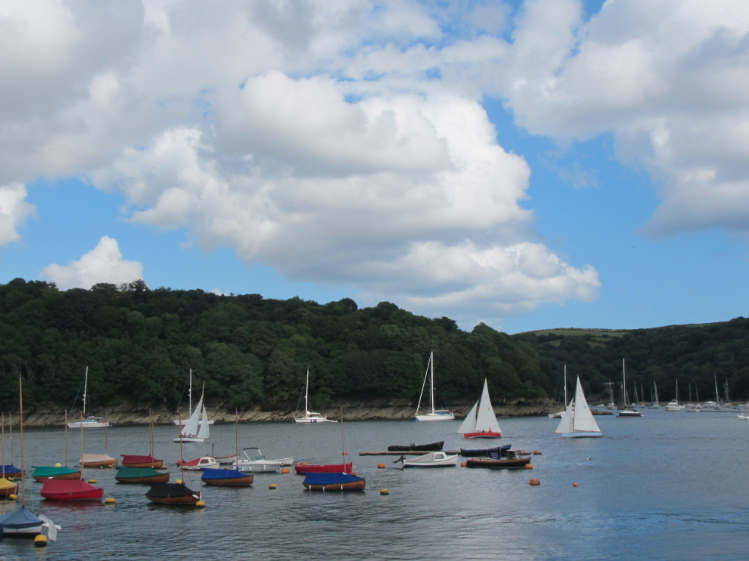 This entry was posted in demonstration (easy), hands-on activity (easy), kitchen oceanography and tagged hands-on experiment, kitchen oceanography, tides, waves on October 31, 2014 by mglessmer. The movie contains both a view from a co-rotating camera and from a non-rotating camera. Gezeiten im rotierenden Tank, in dem die Anziehung durch den Mond durch Erdanziehung simuliert wird, die wir durch eine schräg stehende Rotationsachse simulieren. Im Film zeigen wir sowohl den Blick aus mit-rotierender Perspektive, als auch nicht-rotierend. This entry was posted in other and tagged JuniorAkademie, tank experiment, tides on August 23, 2014 by mglessmer. Watching the strongest tidal current in the world. Together with my friend P, I went to see the strongest tidal current in the world more than two years ago. And it only occurred to me last night that I had not shown you the movies! If you ever find yourself close to Bodø, Norway, you should definitely go. And either stay for 6 hours or – as we did – go there, leave to do something else, and come back 6 hours later. 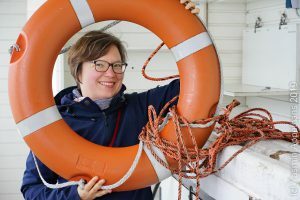 Because the currents at Saltstraumen are not only the world’s strongest currents, but they are also reversing with the tide. How amazing is that? Look at all those huge whirlpools! 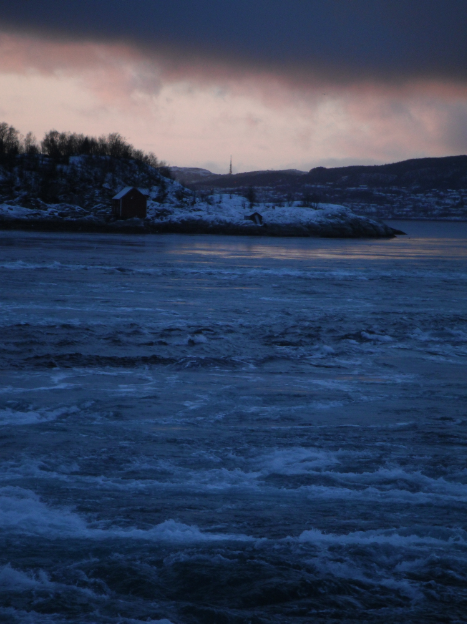 This entry was posted in observation and tagged Bodø, Saltstraumen, tidal currents, tides, whirlpool on June 23, 2014 by mglessmer. Instruction for a very simple DIY tidal model. Today, we built a very simple DIY tidal model in class. It consists of two sets of tidal bulges: One locked in place relative to the sun on the piece of cardboard that we use as the base, the other one with its very own little moon on a transparency mounted on top. Both sets of tidal bulges are held in place by a split pin and a model earth. Now the sun and moon can be arranged all in one line, or at a 90 degree angle towards each other, or anything in between, and the tidal bulges can be mentally added up. If all goes well, this helps students understand the reasons for the existence of spring and neap tides (and from the feedback I’m getting, everything did go well). The tidal model. Upper plots: Different constellations of the earth-moon-sun system. Lower plot: the model “in action”. It is also a great way of introducing the difficulties of tidal prediction on earth. In the model, the whole earth is covered with water, so tidal bulges are always directly “underneath” the sun and the moon, respectively. On Earth, this is hindered by the existence of continents and by friction, among others. Since the little earth in the DIY model has continents on it, this really helps with the discussion of delay in tides, tides being restricted to ocean basins, amphidromic points, declination of the earth etc.. And last not least – these are only two tidal components out of the 56 or so that tidal models use these days. 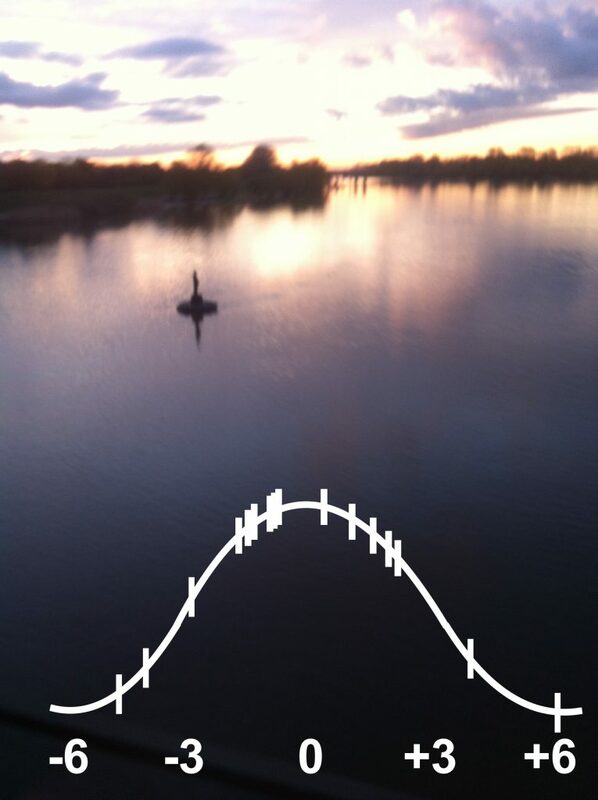 As I said – a _very_ _simple_ DIY tidal model! This entry was posted in hands-on activity (easy) and tagged GEOF130, hands-on activity, model, oceanography, teaching, tides on September 12, 2013 by mglessmer.